With the help of Flexi-Coil equipment, second generation grower David Butcher and his wife, Juliet, grow 2,000 hectares of wheat, 1,000 hectares of barley and 1,000 hectares of legumes on their 4,400-hectare property, Hollands Track Estate, located 15 kilometres west of Newdegate, Western Australia. 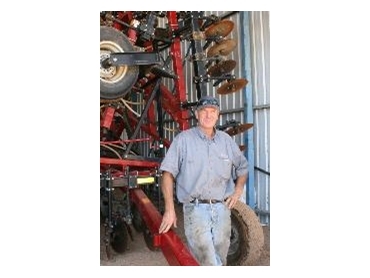 David recently upgraded his on-farm seeding equipment, to include a Flexi-Coil 4350 air cart and a 60-foot Flexi-Coil ST820 cultivator with hydraulic tyne. He believes the new equipment will help save costs. “We use Flexi-Coil equipment because it performs well over a whole range of soil and terrain types. This is important to us because our terrain runs the gamut from gravel to clay and everything in between,” said David. David sows canola to one centimetre, cereals to between 2.5 and three centimetres and peas to between three and four centimetres. “This is our third Flexi-Coil cultivator and air cart combination but this time we’ve gone with the three-bin air cart which allows us to put urea in alongside the seeds. This is more efficient than the broadcast spreading of fertiliser we did before, so it will save us around 20 per cent in urea costs. That means the third bin on the machine is practically paying for itself,” said David. The Flexi-Coil ST820 cultivator with a hydraulic tyne allows David to make only one pass with the seeder, saving time and fuel. “Flexi-Coil makes it possible for us to do minimum till because it’s robust and so good with depth control, especially with different soil types,” he said. “So even when we go from sand to clay, the seeding depth doesn’t change. The hydraulic tyne is softer on the recoil, which is better for our unpredictable soil and reduces wear and tear, so there are fewer maintenance costs. “Investing in technology like the Flexi-Coil equipment helps us to reduce costs overall, increasing profits,” David concluded.